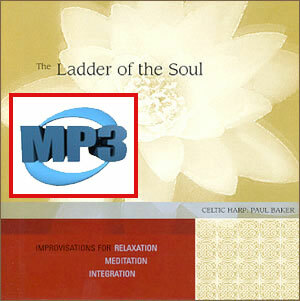 These products are mp3 audio track downloads of music from The Ladder of the Soul CD by Paul Baker. Peaceful relaxation and meditation music performed on a Dusty Strings FH-36B Celtic harp by master harpist Paul Baker. Following in the tradition of The Tranquil Harp CD, The Ladder of the Soul presents eight improvisations in keys corresponding to the energy centers of the body. The improvisations are designed to ground your body, open and tune your mind, balance your emotions and soothe your spirit. The pure and ancient sound of the harp, sometimes called "the ladder between earth and heaven," is ideal for relaxation, meditation and integration. Each track is provided with a suggested meditation.